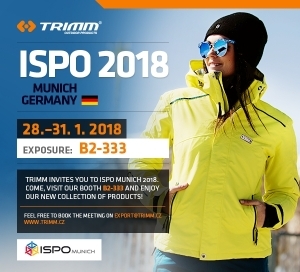 HomeArchive TRIMM is heading to ISPO 2018! TRIMM is heading to ISPO 2018! We entered the new year 2018 and it means that ISPO show is knocking on the door. We are glad to announce that TRIMM will be exhibiting at the prestigious show again! As always, ISPO 2018 will take place at the Munich fairgrounds from 28th to 31st January 2018. If you are planning to visit this famous exhibition, you are more than welcome to stop at our booth located in hall B2, booth number 333, where you can see the newest skiwear and outdoorwear collection FW 2018/19, as well as the collection of camping equipment.